Picking From Height: How Can You Make it Safer? Many companies need to retrieve goods from these positions, and there are several options. Rolling warehouse ladders, lift truck picking cages, and wave pickers are among them. Another is to use a lift truck, unload the pallet, pick what's needed, and replace it. At some companies, employees have even climbed the rack, which is obviously unsafe. What's the best method? Let's break it down. The first question to answer is if the picks at height can be avoided. If you're frequently picking from height, you probably need to re-slot that product to a lower, more accessible position. Periodic re-evaluation of where your most frequently picked items are stored can yield big results for both safety and productivity. A pick at lower position tends to take less time than one at height, so slotting items that are being picked frequently to a floor position is usually a productive move. If you can improve things by changing your storage layout, segment the warehouse so that the manually picked items are placed away from lift truck areas, segregating pedestrian and vehicle traffic as much as possible. Ladders can be good, but the larger and more unwieldy the item, the less effective and more unsafe they are. Although a correctly-specified rolling warehouse ladder with proper railing system can be a safe, fast, and effective order picking method, there is always the risk of falls when people climb ladders. If you use a ladder, be sure it has a large work platform and guard rails, and be sure people aren't using it to pick heavy, bulky items that can more easily unbalance them. 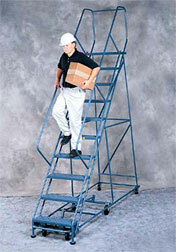 You should never pick from a conventional stepladder or extension ladder. Neither have sufficient working platforms or safety guards. Using forklifts works, but it comes at a price in time and productivity if you have to ensure aisles are always clear and that a lift truck is always available when something needs to be picked. You can remove pallets, lower them, and order pickers can take what they need. This allows a picker to stay on the ground and lets the lift truck position the pallet right where he needs it, at a good working height. It can be more ergonomic than picking from a pallet on the floor. This either takes two workers, a driver and a picker, or a single worker doing both tasks. The other way is a forklift work platform that lifts the picker to the top level product. Too often, companies allow workers to do this on pallets, which is an accident waiting to happen. A work platform is the solution. It's good for maintenance projects as well as order picking. A good work platform will have a non-slip deck, a toe plate to contain loose objects, and will be held to the lift truck with security chains. They tend to have side rails that are around 42" height and separate the worker from the vehicle.